Alexander Kerr, Professor of Violin at the Indiana University Jacobs School of Music and former Concertmaster of the Royal Concertgebouw Orchestra in Amsterdam, accepted the position of Principal Guest Concertmaster of the Indianapolis Symphony Orchestra in the fall of 2007. Mr. Kerr continues teaching and performing at the IU Jacobs School of Music while also performing with the ISO and in solo and chamber engagements throughout Europe, North America and the Far East. In 1996, at the age of 26, he was appointed concertmaster of the Royal Concertgebouw Orchestra, a position he recently left to join the faculty at IU. 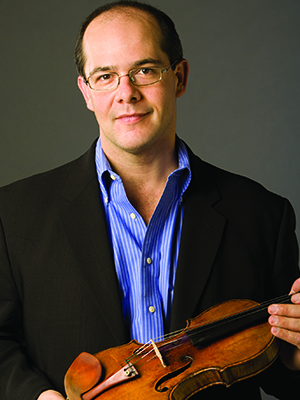 He has also been Concertmaster of the Cincinnati Symphony Orchestra and the Charleston Symphony Orchestra. Alexander Kerr has appeared as a soloist with major orchestras throughout the United States and Europe and as a chamber musician at some of the world's premier music festivals. As a chamber musician, he has collaborated with a number of the world's top musicians, including Grammy Award-winning musicians Joshua Bell and Edgar Meyer. He recently toured Europe with acclaimed violinist Sarah Chang and members of the Berlin Philharmonic. He also has launched a new piano trio with pianist Anton Nel and cellist Paul Watkins. A faculty member of the Aspen Music Festival and School in Colorado, Mr. Kerr also regularly presents master classes at several of the nation's leading music schools and conservatories.